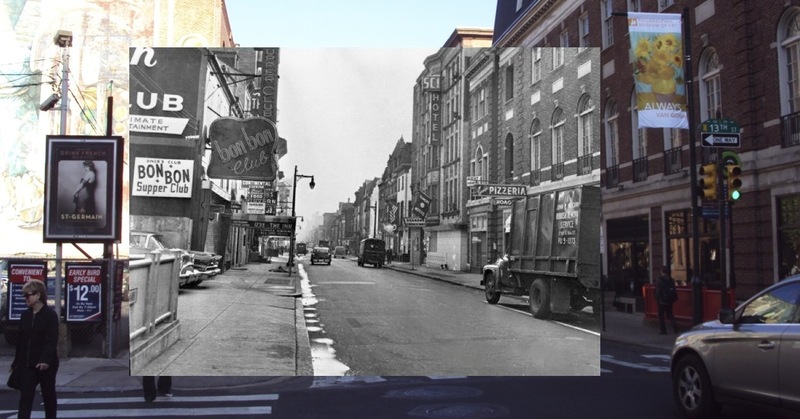 Like so many clubs in the Gayborhood, Sisters, at 1320 Chancellor Street near Juniper, has a long history. It makes its home in what had been a row of stables, then a series of very popular straight dining spots in Center City. The little strip of Chancellor Street tucked away between 13th and Juniper Street was born in the 1850s as Clark Street, then became Kingston Street around 1860. It kept that name until about 1910, when it became Chancellor. 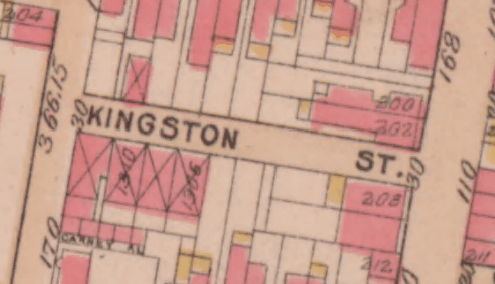 Nineteenth century Philadelphia was notorious for changing its street names every 30 years or so, mostly due to the whims of real estate developers, then to municipal standardization. The network of tiny side streets that criss-crossed the downtown area made perfect locations for small “club stables” that could be rented out. The south side of Clark/Kingston/Chancellor St., above, passed most of the first 60 or so years of its peaceful existence as a row of four club stables. Like parking lots today, the number of rental stables that dotted the 19th century city remind us how dependent residents of the increasingly crowded urban environment were becoming on finding places to store their vehicles and horses. From the late 19th century through the early 1930s, the buildings served as stables for Emily Williams Biddle, the great-great granddaughter of John Biddle who settled here in the 1730s. The carriage house was occupied by her driver, Michael Cole. 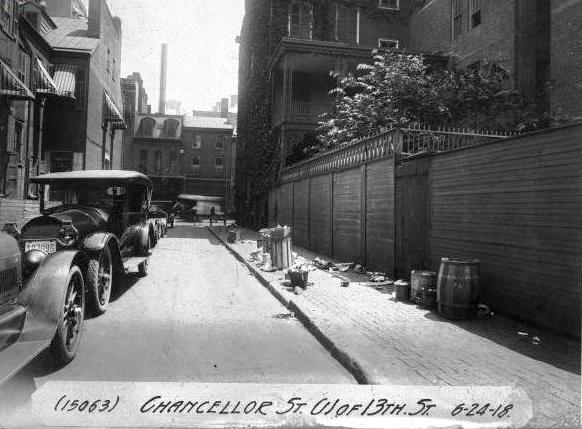 In the photo of Chancellor Street looking west from 13th St. in 1918, below, you can see the awnings of the stables and carriage house on the left. The photo is from the wonderful collection at the Philadelphia City Archive. Many thanks to reader Jim Cole who shared this information about Emily Biddle and his great-grandfather, Michael Cole. In 1933, during the middle of the Great Depression, a retired bantamweight boxer named Frank Bloch opened a restaurant near the corner of Juniper and Chancellor. He called it Frankie Bradley’s, after the professional name he’d used while in the ring. It was common at that time for Jewish prizefighters to use Irish names. (Were Irish considered “tougher” than Jews?) For over 50 years, the family run business would be a landmark gathering place for visiting celebrities and local politicians, including Jose Ferrer, Lucille Ball, Tony Randall, Robert Preston and the ultra-campy Charles Nelson Reilly. Frankie Bradley’s has been called Philadelphia’s Sardi’s; the walls were covered with pictures of stars who dined there. The restaurant was known for its hearty chicken, lamb, seafood, and garlic-laced planked steak, all accompanied by ethnic Jewish touches like matzoh balls, kreplach and chicken soup. When Frank died in 1976, his son, Harold Bloch, and daughter, Dorothy Adler, took over the business. Harold died in 1983, a few months before the restaurant’s fiftieth anniversary. The still popular restaurant continued to be run by a small corporation for a while, then closed in the fall of 1986. In February of 1987, the restaurant re-opened as Hesch’s (Yiddish for Harry’s). At the helm was Philadelphia’s man-about-town, Harry Jay Katz. The ambience was lower East Side Manhattan kitsch, the food was slightly updated 1980 Eastern European steakhouse: huge portions of cholesterol laden, but totally delicious brisket, stuffed cabbage, beef and noodles, and, of course, steak. Hesch’s attracted the same show business clientele as Frankie Bradley’s; it was Philadelphia’s prime spot for star watching. 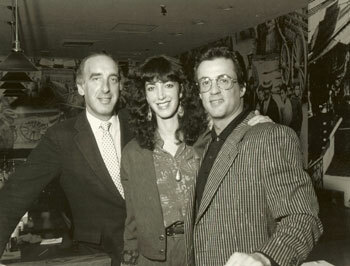 When Sylvester Stallone, on the right, above, with Harry Katz on the left and Harry’s daughter Susan, center, was shooting Rambo III in Israel, he couldn’t find a decent steak, so he called and ordered a dozen from Hesch’s – garlic on the side. Hesch’s lasted about two years, closing in 1990. Bon vivant Katz, now in his 70s, is still going strong and still pops up in Philadelphia tabloid headlines from time to time. For a few years in the 1980s, there had been as many as four women’s spaces in Center City: Sneakers on N 3rd St., Mamzelles on Quince, the upstairs at Seasons on Drury St. and the Two-Four on St. James. The early 1990s gave women Hepburn’s on 12th St. When Hepburn’s closed in 1995, the city’s lesbians were left without a bar of their own. A year later, on June 21, 1996, Sisters, owned by Mel Heifetz and Jim Ross and managed by Denise Cohen, opened on Chancellor Street. The photo, below, which appeared in Au Courant, is from the opening night. 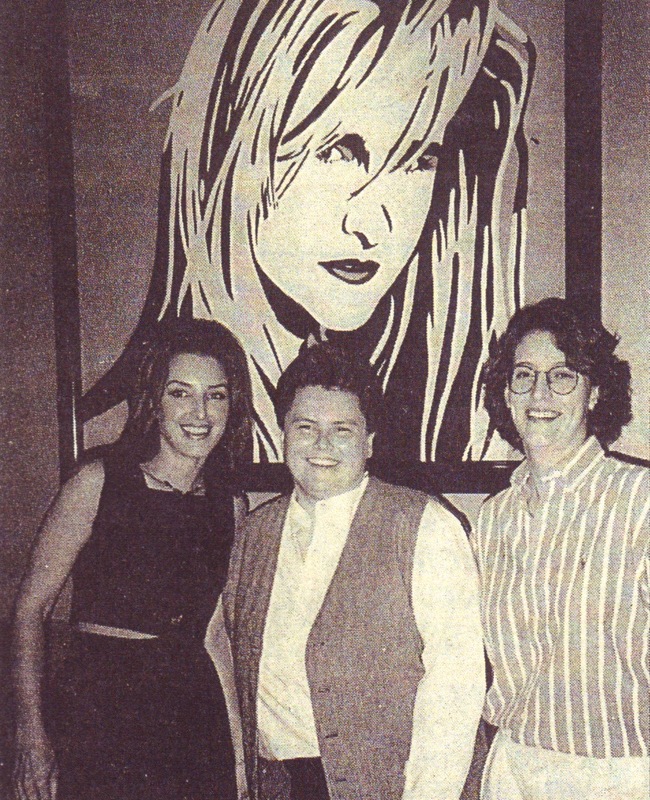 Denise is in the middle, on the right is Assistant Manager Kirsten Hess and on the left is artist Melissa Sweeney who created the lesbian pop art behind the trio. 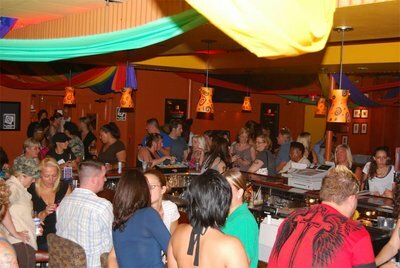 As Philadelphia’s only full time lesbian bar, Sisters had to appeal to a diverse population, often advertising that it welcomed everything from “sneakers to high heels.” There was a main bar and restaurant on the first floor decorated in an understated 90s gray and neon look, a dance floor on the second level, and pool tables in the basement. The formula that the club has used, constantly mixing things up and providing something for everyone, continues to work today. Seventeen years later, still under the watchful eye of general manager Denise Cohen, Sisters is going strong, hosting events and providing dining and entertainment in a clean and comfortable atmosphere for Philadelphia’s LGBT and Gay Friendly communities. Center City’s sole, female-focused LGBT bar Sisters (1320 Chancellor St.) is closing its doors after 17 years, according to posts on Twitter and Facebook. Timaree Schmit, the club’s chief communications officer and member of house dance team Sister Sirens, says she discovered the spot’s plans to close Monday, and that it was all very sudden. The bar has events scheduled through the end of the month, including Schmit’s burlesque show to raise money for the upcoming Slutwalk and fundraiser for an animal shelter. “It was a safe space for LGBT people, especially focused on the women’s community,” Schmit said. “It is the only one in Phily that had that focus.” Schmit said that even though the club still had popular nights and events, the overall numbers at the club had not been as strong of late. On August 14, 2014, owner Mel Heifetz announced that he had sold the former Sisters to Lord Chancellor, LCC, the same corporation to whom he had sold the former Key West on Juniper St. It will reopen as a straight bar and restaurant. Details can be found in PGN here. Thanks for the input, Mel, I appreciate it. I mentioned you in my post on Hepburns and I know about Key West (I’ll do a future post on that), but I didn’t know about your involvement with Sisters. I didn’t move to Philly until 1999, so almost all my info comes from research. No omission was intentional at all. I’m so glad you take the time to read these. Thanks again! Mel, we’re planning on telling the story of the February, 1959 Humoresque raids as part of the 2015 Reminder Day Anniversary exhibit. I have some of the clippings from the Bulletin that covered the story, but I’d love to sit down and talk to you about it when you have some free time. You’re such an important part of the amazing GLBT history of Philadelphia. I love reading about all this history for the Philadelphia Gayborhood. Thanks! Any plans for what will replace Sisters? You were always nice to me when I worked the door. I spent the last 13 years loving that place. So sad to see it go. Hesch’s was always the place to go for great food and celebrity spotting. Our regulars included Mayor Frank Rizzo (at least 3 nights a week), Henny Youngman, Frank Stallone (Sly’s brother), Lily Tomlin, Chaim Topol of Fiddler on the Roof fame (every night for 2 months), Hugh Panaro (Les Miz and Phantom star and accompanied Barbra Streisand on her world tou)r, Donald Trump, Liza Minelli, Jerome Robbins,US Ambassador to Italy and former US Congressman Tom Foglietta, Julius Erving, and the list goes on and on. Actually, the reason we closed was not a lack of business. It was caused by a 13 week Union Picketing under Ray Turchi, the President of the Restaurant Uniion. You can’t make up a loss like that without having to literally triple your prices. So we closed and went Gefilte fishing. Harry, thanks so much for your comments, they add so much to the story. Thank you for the “Thank you”. It’s nice to hear. There’s good news and bad news. As previously mentioned , regarding Hesch’s, the photo of Sylvester Stallone and I, Harry Jay Katz is great. The bad news is that the beautiful woman innthe center of the photo happens to be my daughter, Susan Levin (her married name) and NOT Talia Shire. Thank you, Harry. Setting the facts straight is always good news! At the time the photo was taken of myself and Sylvester Stallone, the woman in the center was neither Talia Shire nor was it Susan Levin. It was my daughter, Susan Diane Katz. She had not been married at that time. Thanks again, Harry, I appreciate your input. I simply identified her as your daughter Susan, which works whether she was married or single. I remember Ray Turchi. My grandfather was part of / worked for the union, Marty Otter. Hi Harry Jay Katz, boy I haven’t seen you around for years ! I used to see you a lot at The late, great Cafe` Erlanger on Market Street. Even saw Bette Midler there. Your family always had the nice house in New Hope, though I don’t see you there too much anymore . Well, I’m still above ground. The Bette Midler show, “Clams on the Half Shell” was stupendous. It ran in Philly at my theater for 6 weeks prior to going to the Uris Theatre in NYC. Our New Hope farms in Solebury Township were sold (700 acres) shortly after my Dad died. It was great, inclusive of the Moss Hart/Kitty Carlisle Estate. I’m downtown quite often with my wife (got married on December 4,2011). She’s terriific. And from Guam of all places. My dear friend, Stu Bykofsky (The Daily News), happens to be dating her sister. Who conveniently lives and works on Capital Hill, in D.C. I guess, now, I’m an official matchmaker. And potentially a best man for Stu — AGAIN. Very good Harry I’m glad to hear that all is going so well with you and yours. Yes Guam is a beautiful place, and a lot of folks don’t realize that is actually part of The United States ! You once even came to my classroom when I was an undergraduate at Temple University to speak to us. Lol it was a course on ” male liberation ” of all things. Yes I know Stu Bykofsky, my father was a well – regarded publicity man in Center City and was friendly with him. But the good news is that you’re downtown quite often so perhaps I’ll have the good fortune to encounter you so I could have the pleasure of buying a drink for you and your lovely bride .